These are so pretty. The set is exactly as expected and good quality, for the price. Lavender -2 Piece Set 2 Custom Framed Prints. 100% Created to last. Individually printed and framed by hand to very high standards. Printed and inspected one at a time utilizing the latest archival UltraChrome Giclee inks Available in 3 sizes for you to choose from Consisting of 2 Total Framed Pieces Each measuring 16''x20'' x .75'' deep Each Piece is Individually Framed Acrylic Glass Each piece includes hanging accessories and is ready to hang. You need only to apply an anchor to the wall of your choice. I have shopped with Overstock a few times, the other products were incredible. The tracking info was awesome and the prints are beautiful - that's where the good news ends. The prints show glue residue all around the edges of the matting on the actual print. They don't have glass they have a ultra thin layer of plexiglass, the prints have waves in them and don't sit flat within the cheap plastic frames. They are headed back to Overstock. No I won't be recommending them to anyone. I am giving it one star since I can't submit without giving a star rating. Prints are very nice and came as advertised (the second time). The wrong frame was sent first but customer service was wonderful and helped straighten out the problem. These pictures look amazing on the wall. They are dainty and peaceful and most of all very pretty. The frames are solid enough. I love them. 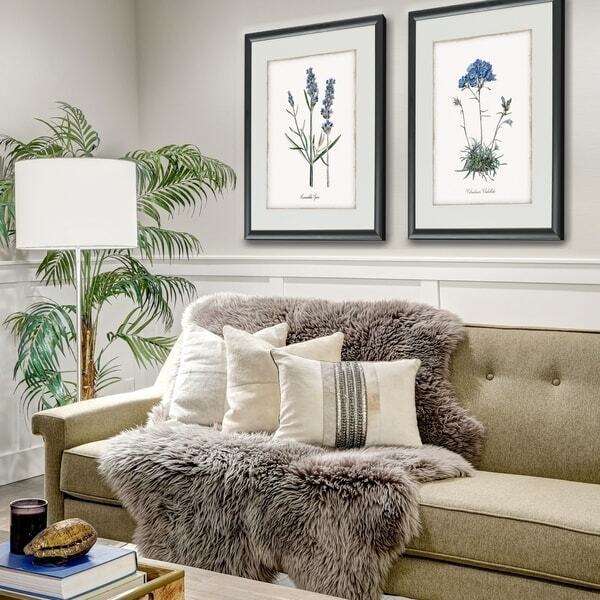 Love the dainty look to print plus black frame is perfect for my bedroom AND price is terrific.